If you are looking for the true taste of traditional Ibiza then the search is over. It would be hard, if not impossible, to beat the traditional, original and authentic Restaurante Cala Mastella. 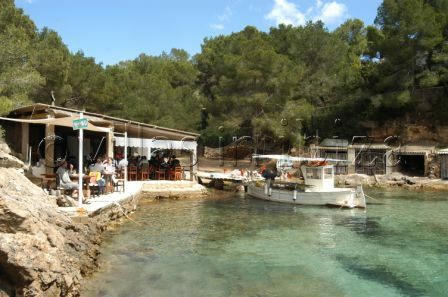 Located just around the corner from Cala Mastella beach, you will need to climb over the rocks to find the restaurant. There is a dirt track that leads down to the restaurant, however it is a track that you’re probably best to avoid, unless you either have a seriously heavy duty off road vehicle, or don’t care about the car you’re driving. The real magic of Restaurante Cala Mastella is that it doesn’t just attempt to be traditional, it is the genuine article. Every morning the owner goes out on his fishing boat while most of the island are still going to bed. Whatever his catch brings in becomes the menu of day, and is cooked on the open fire. There is no electricity and hence no phone line or internet booking system for the restaurant. If you want to book a table, the only way to do it is to pop down to the restaurant early in the morning and make your reservation for that day. It is a well talked about rumour that the King Of Spain once visited the restaurant on his private yacht, but was turned away as no table had been booked. We cannot confirm or deny these rumours; however we can promise you that without an early morning visit to book your table, you can forget about it eating there. So all in all, for a true taste of Ibiza, it is well worth getting out of bed early and ensuring that you and your friends & family can enjoy the Cala Mastella experience. After your meal you can relax on the beach, which is a quiet, secluded and sandy area, ideal for catching some rays during your afternoon siesta. Il mitico El Bigote colpisce sempre!!! Prenota il giorno prima, per essere sicuro di avere posto... ottimo pesce e ottimo risotto... tra i ricordi più belli! !